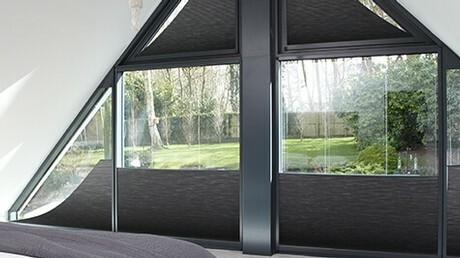 Whatever the look, size or material you like, there is a style of motorised blind to suit you and your home. Somfy powered blinds can help control your home’s lighting, temperature and privacy, as well as enhancing your comfort and security. 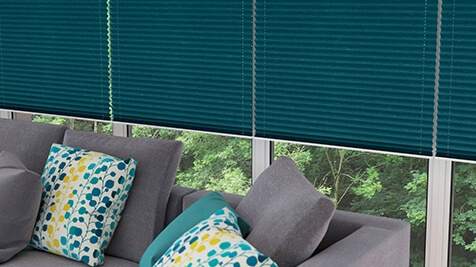 Roller, Roman, Venetian or Pleated blinds… the choice is yours! Roller blinds are a very popular design choice. They require minimal space, with the fabric rolling around the motor tube to open. The automatic control also gives you a smooth operation and tidy appearance every time. With single fabric roller blinds, you can customise the fabric, colour and lining to suit your needs perfectly. Double fabric or ‘duo blind’ designs feature two fabric layers, which move independently from one another to allow for effortless control. Our motors are the best solution for your electric roller blinds. They deliver a smooth operation every time, with a choice of easy to use control options. Your Somfy® motor will be hidden discreetly out of view inside the roller blind tube. These are delivered with the motor already assembled inside for complete convenience. All Somfy® motors are affixed discreetly within your blind system and don’t require any disruption to your decor. Our industry leading motors will deliver unrivalled power to your automated solution and come with a full warranty for your complete peace of mind. 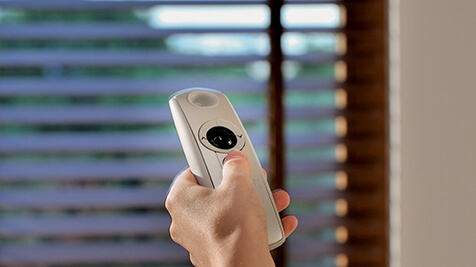 Our range of remote controls boast clever features, such as the ‘my’ button, which allows you to instantly recall your preferred blind or curtain position. They are so easy to use and allow you to control up to 16 different channels simultaneously. 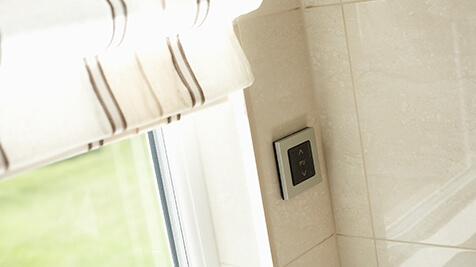 Alternatively, our stylish Smoove wall switches bring lighting control straight to your fingertips. 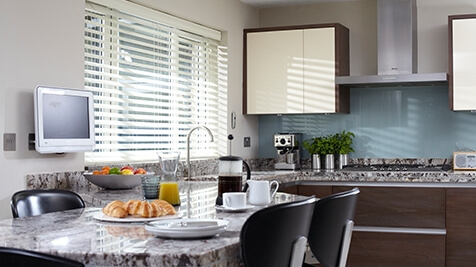 Venetian blinds are classic and timeless. Your motorised Venetian blinds can be operated by only tilting the slats or combining the tilt function with lifting the blinds up and down. 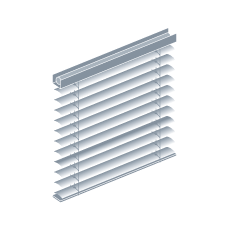 Venetian blinds consist of slats that can be tilted or lowered and raised. They are available in aluminium or fabric, as well as many different finishes and textures. 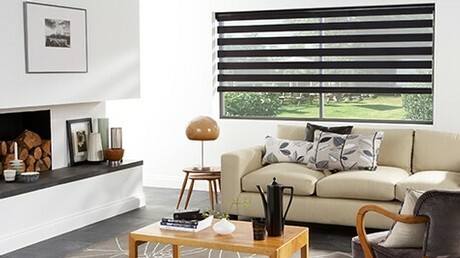 Fashionable and warm, wooden Venetian blinds offer all the same benefits with a natural wooden look. Many different types of wooden slats are available, along with a great choice of colours. Our motors are the best solution for your electric Venetian blinds. They deliver a smooth operation every time, with a choice of easy to use control options. 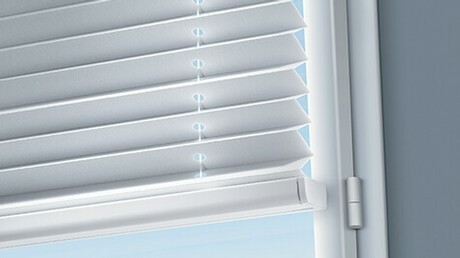 You Somfy® motor will be hidden discreetly out of view inside the Venetian blind tube. These are delivered with the motor already assembled inside for complete convenience. Roman blinds have a classic attractive appearance, which suits both modern and traditional homes alike. 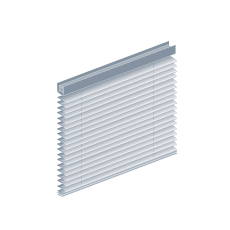 The large horizontal pleats fold away neatly when your blind is operated. 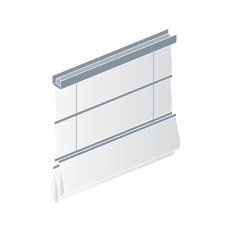 Why choose automated Roman blinds? 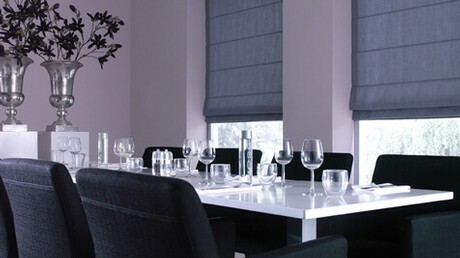 Roman blind fabrics are available in a wide range of light filtering fabrics, from dim out to transparent. 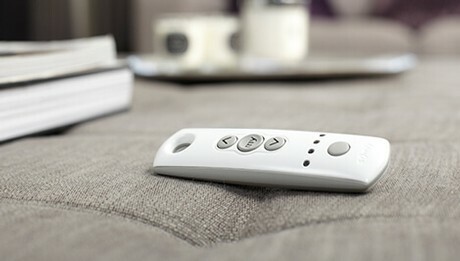 With Somfy® remote controls, you can easily fine tune your home’s natural lighting. 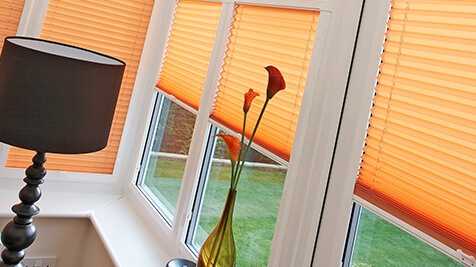 As Roman blinds are often used for larger windows, a motorised solution offers so much comfort, letting you open and close your blinds with just the touch of a button. Our motors are the best solution for your electric Roman blinds. They deliver a smooth operation every time, with a choice of easy to use control options. Your Somfy® motor will be hidden discreetly out of view inside the Roman blind tube. These are delivered with the motor already assembled inside for complete convenience. 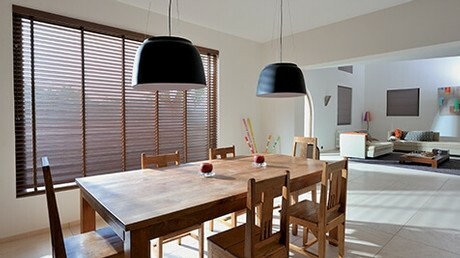 Electric pleated blinds are stylish and versatile. They are commonly used for conservatory windows, which are notoriously difficult to reach. 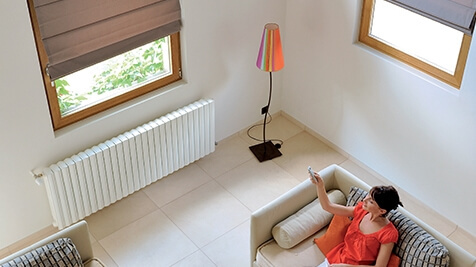 Motorisation to remotely open and close your pleated blinds makes perfect sense. 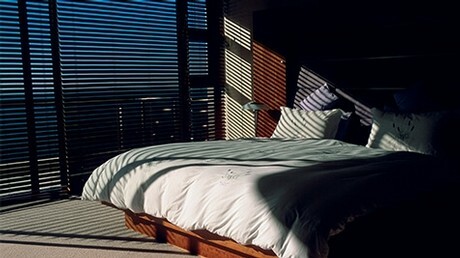 Pleated blinds are a type of window covering that is folded in small partitions and moves up and down by small cords. It’s versatile enough to cover windows in all shapes and sizes. 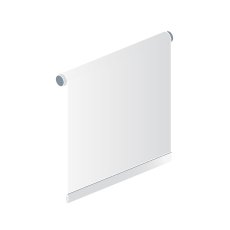 Honeycomb, cellular and double pleated are all names for blinds that have pockets of air. These air pockets help to insulate your windows, keeping warm air in and cold air out. Our motors are the best solution for your electric pleated blinds. They deliver a smooth operation every time, with a choice of easy to use control options. Your Somfy® motor will be hidden discreetly out of view inside the pleated blind tube. These are delivered with the motor already assembled inside for complete convenience.